School of Management graduates Jack Cowell and Jack MacHugh discuss starting a business while studying, and how being at Bath helped them. Going away to university is often the start of one of the biggest journeys of a young person’s life. 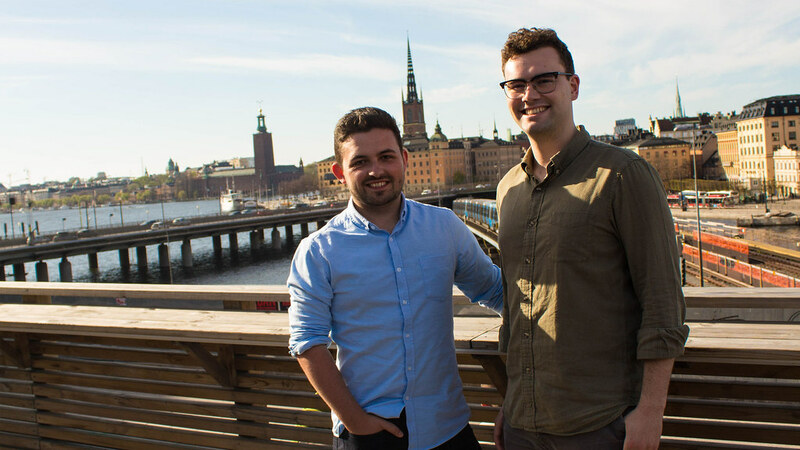 But not content with just keeping their own undergraduate travels on track, Jack Cowell and Jack MacHugh also found time to create Interrail Planner. Their creation is an online tool that makes planning Interrailing trips easier. Cowell, BSc Business Administration, and MacHugh, BSc International Management and Modern Languages, are now graduates. But the journey they started around the kitchen table in their student accommodation is still going strong. Interrail Planner has proved very popular, with 22,000 travellers using it so far. It's generated over £250,000 in sales since launching in 2016, making it Interrail's second biggest affiliate company. In fact, the business made a profit in the first full financial year after the website’s launch, despite being free to use. This success has led to the pair expanding the idea to launch Eurail Planner this year, which is the same service for non-European travellers. Interrail Planner is the answer to a problem Cowell and MacHugh discovered during their own Interrailing experiences. The tool allows Interrailers to plan their entire trip in one place, which was not previously possible. This includes each train journey using an Interrail Pass and places to stay. Users are then referred to booking sites, with Interrail Planner generating revenue through commission. On top of this, Interrail Planner uses a combined map and calendar interface. This means travellers can easily visualise their trips, calculate travel times and make sure their journey fits the rules of their Interrail Pass. “Our own experiences gave us a good understanding of the problems we wanted to solve. The strong consensus from those who had been Interrailing was that the planning could be improved. We shared a gut instinct that the problems were worth solving. The idea for Interrail Planner was born in 2013, but a good business is more than just an idea. Both Cowell and MacHugh took advantage of the University’s Enterprise and Innovation Centre’s competitions. “Both competitions demand that you put a lot of thought into your idea, or why you need money; the Dragons make sure of this. I entered the Den in my first year of university in an attempt to raise funds for an idea related to another business I was involved with, but both my idea and pitch weren’t good enough because I hadn’t thought the idea through quite enough. Learning from this, we put a lot of work into preparing for both these competitions. A sense of community and shareability are at the heart of the business and have helped get the idea out to users. The pair have spent very little on marketing, instead opting for more creative methods to increase awareness. “It was one of the coolest days of my life so far probably. I’d spent ages analysing data from the plans created on our site to create an Interrail insights report, but on a whim decided to also create this heatmap of where people had gone and post it. It went so much better than I could have imagined and was great that the hard work doing the analysis paid off. “After posting it, I spent a lot of the day replying to comments and just refreshing the page to see the upvotes skyrocketing - it was exhilarating. Away from their business, the pair continued with their courses. MacHugh, who studied International Management with Modern Languages (German), believes that his course taught him many of the skills needed to run a small business. He said: “The accounting and marketing modules I did were very helpful and this, combined with running other businesses, allowed us to keep our accounts, bookkeeping and marketing in-house, keeping costs down. “There’s also no doubt that the experience of giving presentations in another language improves your confidence and public speaking in general, which certainly helped us." Interrail passes are only available to European residents, meaning that Interrail Planner was not enough to help everyone. So Cowell and MacHugh launched Eurail Planner, which allows people travelling with a Eurail pass to plan trips in the same way. “Launching Eurail Planner has been much more straightforward than launching Interrail Planner," Cowell said. "We were able to effectively use Interrail Planner as a template, and then make changes to it to suit Eurail, so development was much quicker and cheaper. In terms of launch marketing, we are able to repeat the things that worked for Interrail Planner, but don’t have to bother trying out the things we know don’t work. The pair manage Interrail Planner and Eurail Planner with co-founder Dino Vidakovic, who runs tech consultancy Crionis. As well as controlling both businesses, Cowell works for Just Eat, while MacHugh heads up his own social media management business, 50 Pound Social. Jack Cowell: "Ask yourself, ‘What do I need to do to validate my idea?’ And when validating it, remember that the idea you’re validating is not the idea of a solution, but the idea that there is a problem worth solving. For example, if we started Interrail Planner again, we would be validating that people needed help to plan their Interrail trips (and understanding where in particular they needed the most help), we wouldn’t be validating that an Interrail planning website with X and Y features was a good idea. It’s a subtle difference, but it’s important." Jack MacHugh: "Get involved in the Business Plan Competition. It’ll really help you hammer out a good business plan and you’ll work together with a mentor to help fine-tune your idea. Even if you don’t win it (we didn’t), it’s a fantastic process to go through. Take advantage of what the University offers while you’re still there."